There is a little Italian restaurant located directly across the street from my office in midtown. Because of its convenient location, this restaurant has become our unofficial office restaurant and the inevitable destination of all business lunches and holiday luncheons. Along with the regular menu, our waiter filled us in on a list of specials, one of which instantly grabbed my attention: little balls of mozzarella, wrapped in prosciutto, baked in marinara sauce. I ordered it right away, and delighted in the tiny dish or warm baked mozzarella goodness. That night, I decided to recreate the dish at home, replacing the marinara with a spicy arrabiata sauce, and multiplying it by about 20. The results were incredible! ...and I admit to having made the dish a full THREE times since. It's a perfect appetizer to start an Italian meal, and even makes for a nice little lunch (along with a salad and maybe a crusty heel of Italian bread). You can easily customize the dish at home using your own favorite sauce. I really love the heat of the arrabiata and encourage you to try it first, but a classic marinara or maybe even a vegetable sauce would work well too. Vegetarians can skip the prosciutto and wrap the mozzarella with basil leaves before burying in the sauce. And if you have trouble finding the little round ciliegine (in Italian, "ciliegi" means cherry), you can just cut a regular size ball of mozzarella into 1" cubes. 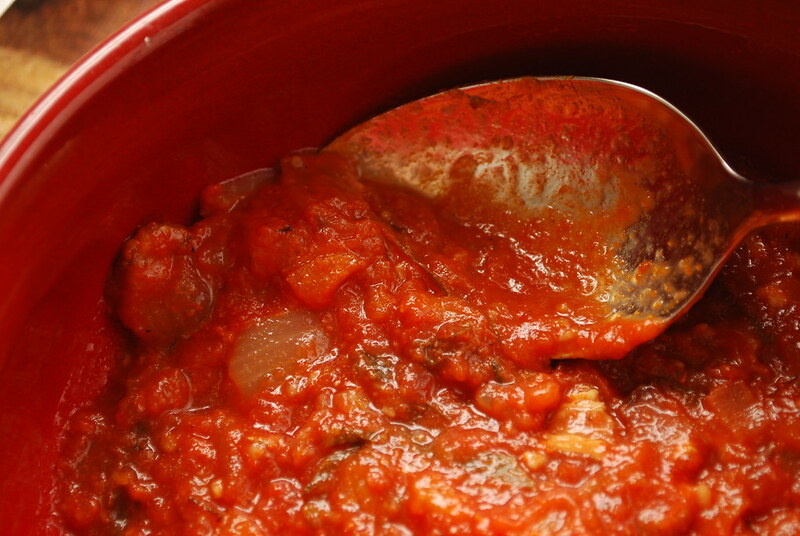 Arrabiata is a spicy Italian tomato sauce. For this recipe you can use a good bottled one (I like Rao's) or make your own. 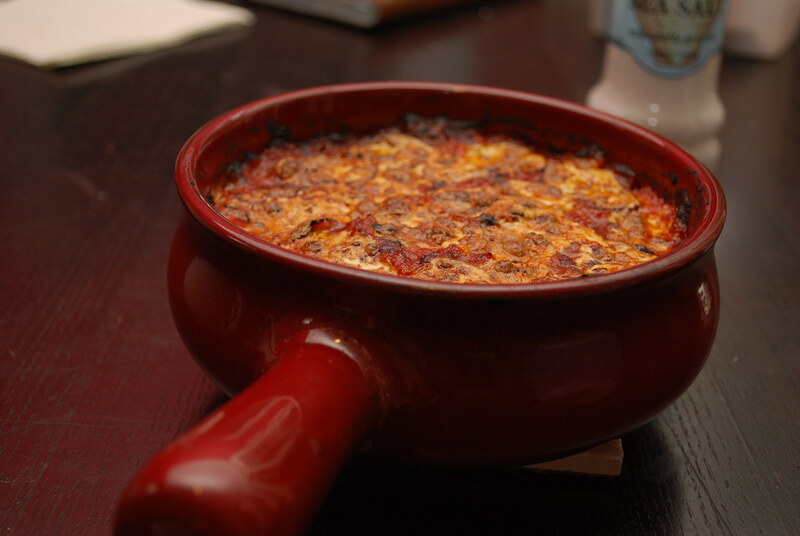 Spread 1 cup arrabiata sauce along the base of a small (about 6") baking dish or ramekin. On a clean work surface, cut each strip of prosciutto in 1/3. 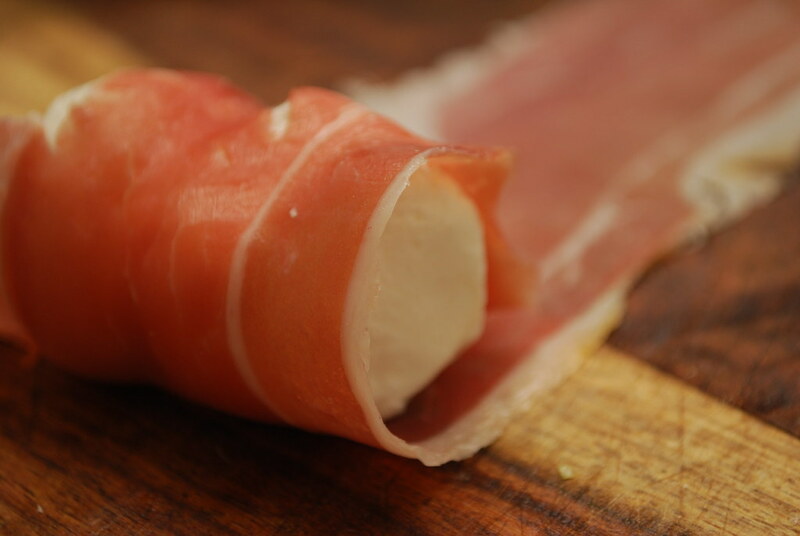 Take 1 ball of mozzarella and roll up in the 1/3 strip of prosciutto (it's ok if it's not perfect). Tuck seam-side down in the baking dish. Repeat with all the mozzarella until you run out of prosciutto, placing each prosciutto-wrapped ball tightly against the next, nestling them all into the baking dish. Top the mozzarella balls with the other cup of arrabiata sauce, making sure to cover the entire surface of the baking dish. Sprinkle the top with a little grated pecorino and drop a few slices of extra mozzarella around the top. Bake in your preheated oven for 20 minutes or until the dish is heated through and bubbling. If you'd like, you can place under the broiler for an additional 2-3 minutes until the cheese on top is toasted. Top the baked dish with a few leaves of fresh basil. Serve immediately. You know, little balls of mozzarella, wrapped in prosciutto are pretty damn good all on their own. Smothering them in arrabiata sauce sounds like dying and going to appetizer heaven. ps: You made this three times in 1 month? Now I HAVE to try this recipe! pps: the prosciutto photo is beautiful! I am always looking for fabulous appetizers, and this one seems super simple and delicious! I love this! It looks completely delicious and I prefer the idea of a spicier sauce. I do this too...go home and re-make something that I've eaten at a friend's house or restaurant and then put my own spin on it. I think in grade school they called it piggy-backing. Taking a good idea a little further to make it better. Good call! Really, is there anything better than pecorino? Maybe some fresh mozzarella, but that's it. And this has both. Amazing. Oh man, I think I have died and gone to heaven. Cheese, prosciutto and spicy tomato sauce? Big bottle of wine, something trashy on the TV and a bowl of this and I wouldn't come up for air for days.